In more unfortunate news, rapper Erick Sermon has suffered a heart attack (11/12). According to DJ Scratch the emcee is ok and the folks at Rap Radar reported that they saw Erick at DJ Eque's birthday party last night. Rappers and celebs including Raekwon, Russell Simmons, and more have responded to the news. Check out there tweets below and stay tuned as the story develops. 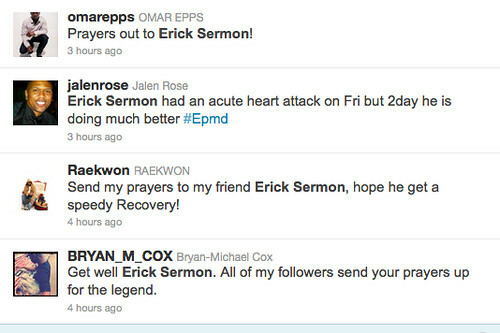 Erick Sermon is one half of legendary rap group E.P.M.D. Update: The Green Eyed Bandit told Global Grind he was recovering and should be home shortly. "I'm good! I got two more tests on Monday and Tuesday then I'm home hopefully on Wednesday."